I'm heading to Texas -- to the Professional Photographer's of America gathering known as ImagingUSA, where I will be presenting on, what else? Best Business Practices for Photographers. My Monday session, January 15, causes me to be an early riser that day, but I am excited about this presentation. 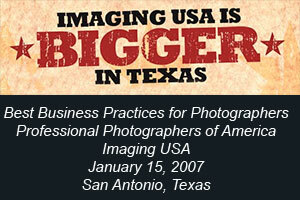 To learn more, visit ImagingUSA.org.